The Slants have been featured on NPR’s All Things Considered in a segment entitled The Slants: Trading in Stereotypes. This is a band I’ve always meant to post about but always forget. 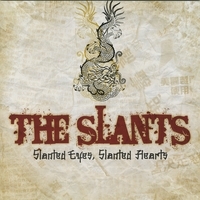 The Slants are a “Chinatown dance rock” band from Portland, OR. Some of the members are Asian and others are not but who cares? They’ve gained a following from appearing at several anime conventions. They’re kind of like the new Peelander-Z if you know what I mean. The All Things Considered article explains how band members A-Ron and Young experienced racism growing up and how their band is defying such stereotypes now. The song “Sakura, Sakura” is an anthem for all those who have been looked down upon–“This song’s for the Japanese, and the Chinese, and all the dirty knees.” Their self-released remastered album Slanted Eyes, Slanted Hearts is now available through CDBaby and iTunes. You are currently browsing the J-Rock Explosion blog archives for the day Monday, June 16th, 2008.